Kitchens and bathrooms are main focal points in any home especially if you are buying. 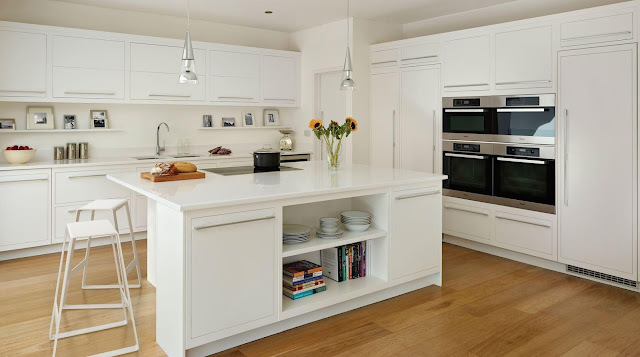 For me a place which has an old and tired looking kitchen can be very off putting..why...because modern kitchens are expensive to replace (if you are buying) however if you can afford to do so then its definitely worth the money. If getting a brand new kitchen is out of the question then there are little changes you can make to update an old / tired looking one. 1. Clear out clutter and rearrange all your draws / cupboards to create space for things you put on the kitchen surface. De cluttering surfaces can give that minimal tidy look and its also easier to keep clean and tidy. 2. Sometimes changing a few bits like the surfaces can make a huge difference eg: marble surface can instantly lift any tired looking kitchen. 3. If you really want a new modern kitchen you can look at buying ex showroom kitchen at fraction of the cost. 4. Swap out hardware - old cabinets from the 1930s can easily be updated with the addition of beadborad doors plus new modern knobs and pulls. 5. DIY - add a fresh coat of white. Unify everything with my favourite white paint. 6. Be creative with lighting - updating the style of lighting you have in the kitchen can change the look completely. 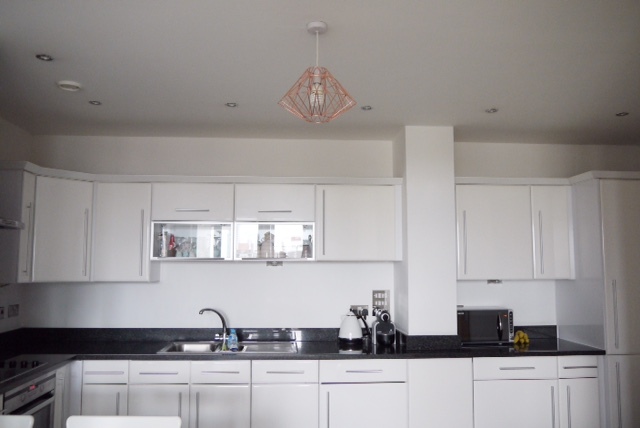 We love the spot lights in our kitchen its nice and bright. 7. Fresh plant such as pots of herbs (greenery does wonders) or fresh flowers can instantly brighten things up. 8. Open shelving has been popular in recent years creating a sense of space and play around with chalkboard painted walls. 8. Indulge in one expensive item such as granite surface tops or an extra deep sink these can be focal points in your kitchen. 9. Add texture so throw out old tea towels and pick new ones that go with the theme you are going for and make sure they are ironed as they will be on display. Adding texture can make it cozy a place where the whole family likes to hang out. Display books artistically is always popular with keen cooks. 10. Lastly if you cannot afford to do too much then stick to point 1. A photo of my kitchen above...I could do with adding a few pots of herbs to give it a splash of green colour and possibly displaying a few cook books and tea towels for some texture or even something as simple as a fruit bowl to brighten things up. What might also look good is those clear jars for pasta being on display on the far left with the cook books will look good...let me know what you think?